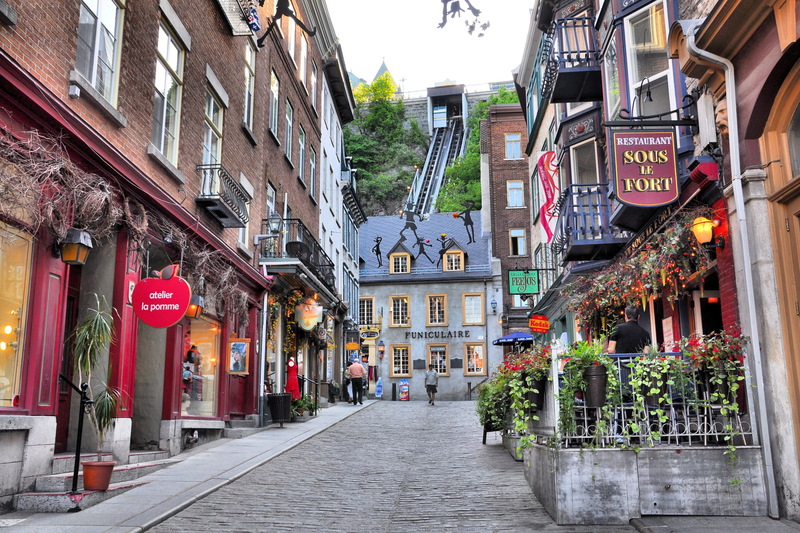 A stroll along rue Saint-Jean is a must for anyone visiting Québec City. Starting from centrally located Place D’Youville, a string of boutiques, restaurants, churches, and historic buildings create a unique and eclectic ambiance. And when the street is closed to traffic in summer, pedestrians take over and a festive atmosphere reigns. Beautiful Montmorency Falls Park is just a few minutes from downtown Québec City. The waterfalls are 83 m (272′) tall, a full 30 m (99′) higher than Niagara Falls. Groomed footpaths throughout the park lead past several lookout points. You can admire the view from the cable car, suspended bridge or stairs climbing up the side of the cliff. Three via ferrata routes are located near the falls. At the Montmorency Manor, you will find a restaurant, gift shop and interpretation centre. A snack bar is located in the cable car station. Open year-round. Day or night, Grande Allée’s sidewalk restaurants and cafés and beautiful architecture attract big crowds. The street’s excellent restaurants, bars, and nightclubs make it the perfect place to start—and end!—any evening. Rue du Trésor, a real open-air art gallery featuring charcoal drawings, watercolors, and oil paintings. Located between the Château Frontenac and the Cathedral-Basilica of Notre-Dame de Québec, a host of artists display their works on the walls that surround it. In front of the Parliament Building, Fontaine de Tourny’s 43 water jets, arresting masks, and graceful figures immediately draw the eye. Close to 7 meters tall and 4 meters in diameter, it casts a powerful spell when lit up at night. The fountain was inaugurated on July 3, 2007. 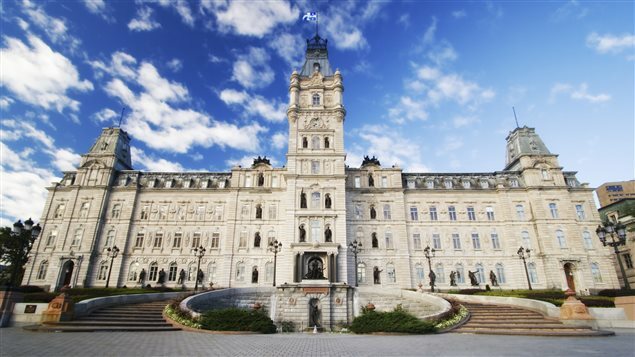 It was a gift from Simons department stores to the City of Québec for its 400th anniversary. The people of Québec City immediately took it to their hearts, and it has become a source of pride. At the bottom of Côte de la Montagne lies the Petit-Champlain district, a picture-perfect neighbourhood resembling a quaint riverside village. Since Québec’s foundation in 1608, this area has evolved to a small portside village with fur trading posts and elegant homes. Over the years, its fortunes waxed and waned. Today, as a result of an expansive urban restoration project, Quartier Petit-Champlain comprises narrow streets lined with one-of-a-kind boutiques and bistros. 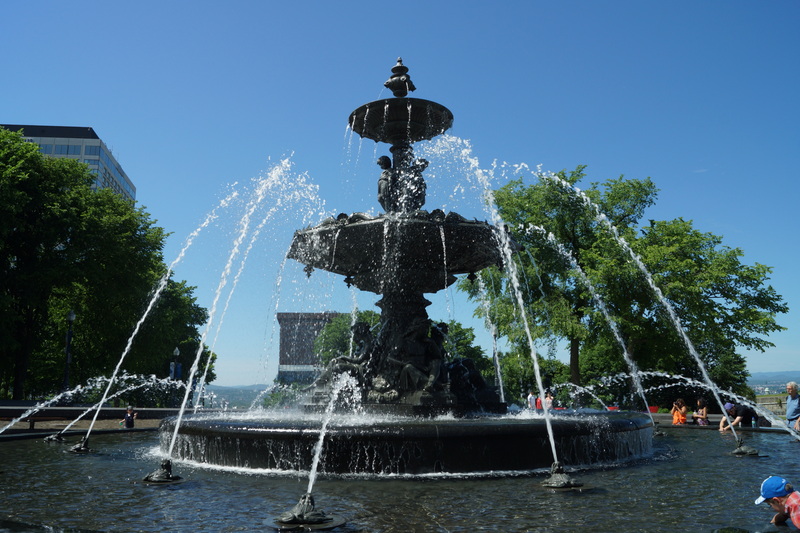 Visitors come in droves throughout the year to see the impressive historical architecture and cobblestone streets, making the Petit-Champlain one of the most popular attractions in the city. All year-round, visitors are enchanted by the romantic European atmosphere of this quaint neighbourhood, site of the Québec’s first port, and can see here some of the colony’s first houses. 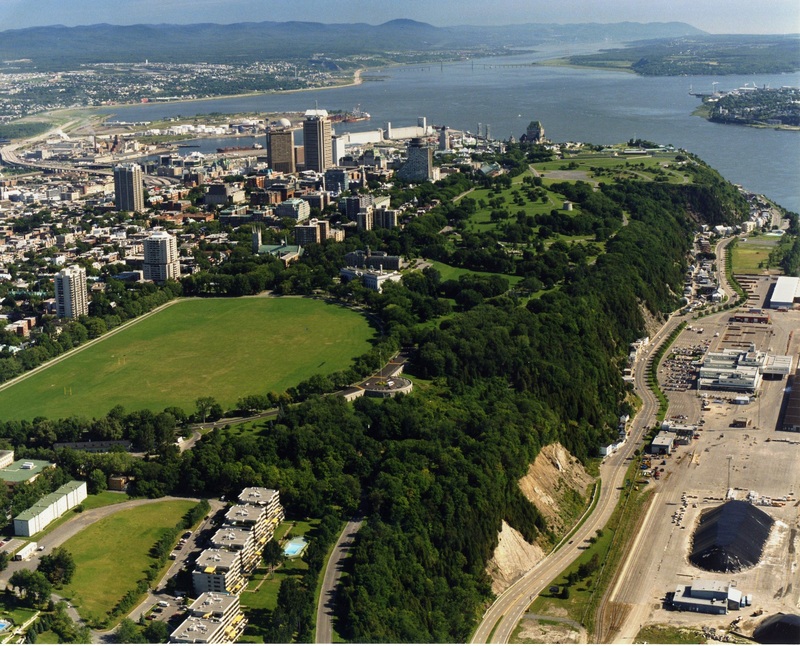 Canada’s first national historic park, Battlefields Park, which includes the Plains of Abraham, was created in 1908 to mark the 300th anniversary of the founding of Québec. The 98 hectare park is a vast playground that draws sports enthusiasts, strollers out for a breath of fresh air, and families in search of an idyllic picnic spot. A jewel in the park’s crown, the Joan of Arc Garden is a delight for the senses, with over 150 plant and flower varieties on dazzling display. 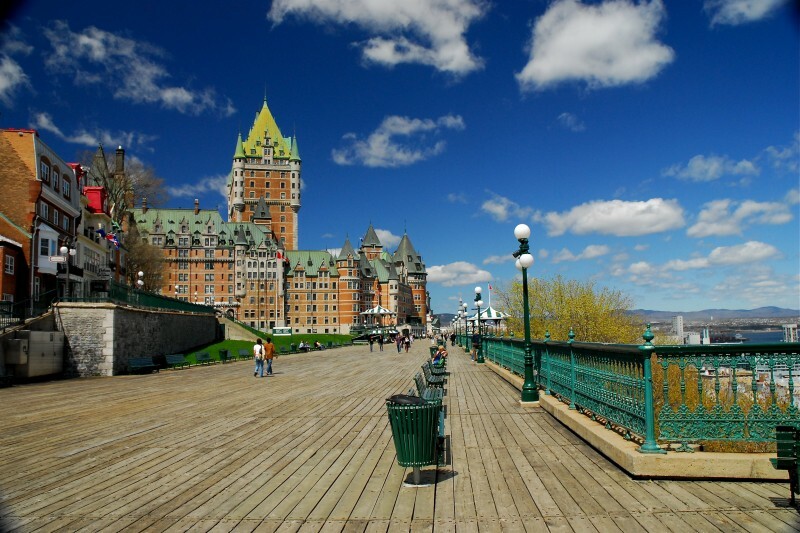 Stretching from the foot of the Citadelle to Château Frontenac, Dufferin Terrace offers breathtaking views of Île d’Orléans, the St. Lawrence River, the City of Lévis, and Québec City’s Lower Town, making it a perfect spot for taking photos. The 671-metre-long wooden boardwalk is a popular year-round gathering place. The most important historical site in Québec City. The Parliament Building is an imposing structure comprising four wings that form a square of about 100 metres (330′) per side. One of the few buildings in North America whose architecture in Second Empire style. The tour of the Parliament Building includes the National Assembly Chamber (where the members of provincial parliament sit) with its Renaissance architecture and the Legislative Council Chamber (standing committees have been held here since 1968).